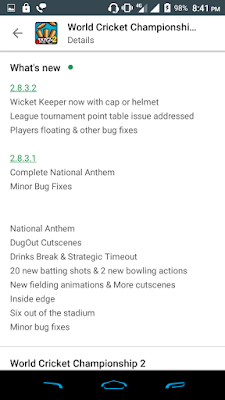 World Cricket Championship 2 2.8.3.2 update is live. In this update, Nextwave Multimedia add 2 new features. Hurry!!! update now. If you play Wcc2 previous update, then you all are noticing many bugs are available in that game. So, we all are thinking that any next update will be the only Bugs fix update. But no we all are wrong, in this update, they bring some exciting features for us. What are they? So, we have read this article to know those features. We all know that Nextwave Multimedia is an active company because they bring update his game on a monthly basis. So, that way when they notice some bugs in his game then they quickly start working to fix those things. That's why we loved the World Cricket Championship 2 very much. Le's discuss what we all get in this 2.8.3.2 update. This feature makes the game more realistic because if you watch live cricket matches then when the wicketkeeper come close to the stumps. Then he/she use the helmet to protect from a hit. Now you can also fell the same experience in World Cricket Championship 2 game. 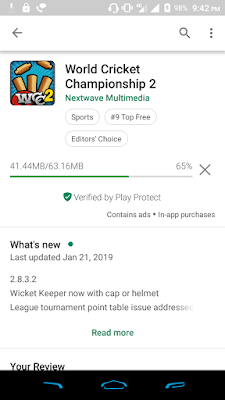 After you update this game you can see Wicketkeeper use both Cap or Helmet. After this update, you can no longer to see the bugs on League Tournament Point Table. Which is good for us. If you played 2.8.3.1 update then you surely faced players floating bugs. Yes, all the players are floating on the ground. Yes, it's was so funny, but now it will be fixed in this update. 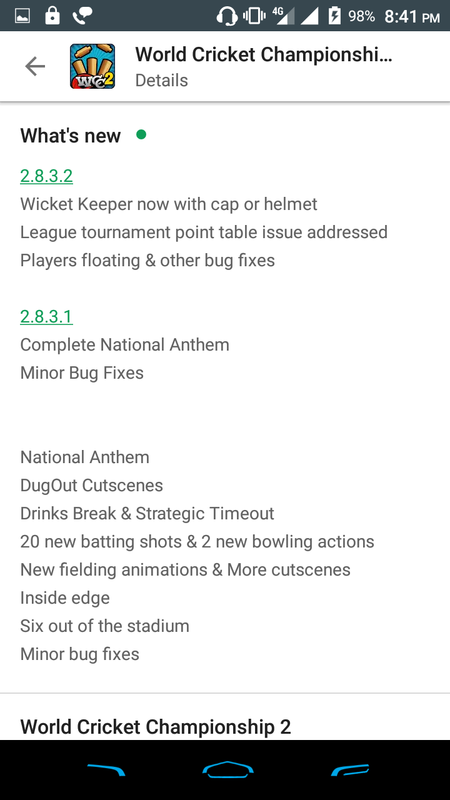 So, these are the features we all get in this update, but now I think next update will be the bigger update from this because after bugs fix the company will be working on other features. So, make sure to allow the Notification on our website to get future updates. Thanks For Reading If You Have Any Doubt Then Let Us Know In The Comment Box And Share This Article With Your Social Friends.